Slow Fast Slow is a video editing application for the iPhone that allows you to speedup or slowdown your videos on your iPhone. You can also trim clips or even reverse clips so that they play, well, in reverse! Slow Fast Slow is free to download in the App Store. Slow Fast Slow is iPhone only. I use Slow Fast Slow often, especially the reverse clip aspect, before importing my videos to edit in Cameo. 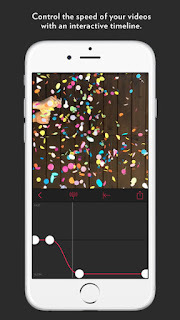 Slow Fast Slow is probably my second most used video editing application on my iPhone for mobile editing. It is a well designed application, easy to use with a learning curve level of ZERO! Slow Fast Slow works really well with Slo-Mo videos that you have shot on your iPhone. While I do not shoot slo-mo videos often on my iPhone, I normally slow them down with Slow Fast Slow, I have played with the slo-mo videos and imported them to Slow Fast Slow and it works exceptionally well. • 240 fps videos (iPhone 6 and 6 Plus) can be slowed down to 1/16 speed, which is twice as slow as the built in camera app. • Pitch Control: Retain the correct audio pitch even when the video is sped up or slowed down. • Backwards playback. • Add and remove points to adjust the timeline. • Export videos in the original ratio or square. I have tried to use the pitch control in Slow Fast Slow, personally I prefer to mute the audio all together for any video where I have adjusted the speed. I prefer to add music to my clips and feel that gives the video a better creative flow. I didn’t mention this in my video review but it is a feature of the app. For more info about Slow Fast Slow please visit the developers website; http://www.studioneat.com/products/slowfast. Also mentioned in my video preview, at the end, was the Glif from Studio Neat. Highly recommended. You can purchase the Glif in app using Apple Pay. I own one and love it. The Glif is my most used 3rd party iPhone accessory.